Jamie delivers an exceptional lesson experience and ranks in the top 15% of our teachers nationwide. Soprano Jamie Balter most recently received recognition by both The American Prize in Voice and New York Lyric Opera Theatre Competition for her performance of works by Strauss, Mozart, and Wagner. A native of Baltimore, Ms. Balter earned her Bachelor of Music in Vocal Performance from the University of Miami’s Frost School of Music and is currently pursuing a Master of Music degree in Vocal Performance from the University of Alabama under where she is a student of Dr. Paul Houghtaling. As a member of the University of Alabama Opera Theatre, Ms. Balter will sing the roles of Consuelo in West Side Story and Rosalinda in Die Fledermaus in the upcoming season. During the 2017/18 season, Ms. Balter appeared as a guest artist in Visions of Dreams, where she performed selections by Duparc, Schubert, Mozart, and Lehár. In July 2017, she made her role debut as Donna Anna in Mozart's Don Giovanni at the Centre for Opera Studies in Italy. During the 2015/16 season, Ms. Balter returned to the Hawaii Performing Arts Festival as Marcellina in Mozart’s Le Nozze di Figaro, where she also covered Countess Almaviva under the baton of Maestro James Richman. In addition, she appeared as La Chatte/L’Écureuil in Ravel’s L’Enfant et les Sortilèges. Previously, Ms. Balter joined the roster of Russian Opera Workshop, where she covered Zemfira in Rachmaninoff’s Aleko and the title role in an abridged version of Tchaikovsky’s Romeo and Juliet. Balter began the 2016 season as a guest artist in From Heidelberg to Hanover, where she performed Strauss’ Four Last Songs in addition to selections from Lohengrin, Der Freischütz, and Tannhäuser with Lyric Opera Baltimore Artistic Director, James Harp. Highlights of the 2014/15 season included Second Lady in Mozart’s Die Zauberflöte with the Hawaii Performing Arts Festival, Alice (cover) in Verdi’s Falstaff with Harrower Opera Workshop, and An Evening of Opera & Song with the McDonogh Guest Artist Series. Ms. Balter holds the position of Artistic Administrator at the Hawaii Performing Arts Festival having previously served as Director of Admissions. Jamie Balter maintains a private voice studio in Tuscaloosa, Alabama, previously having studios in Springfield, Illinois and Miami and Tallahassee, Florida. She has previously served as the head of the voice program at The Music Factory in Springfield, Illinois and served on the faculty at The Stubbs' Music Center in Tallahassee, Florida. This spring, Ms. Balter will be teaching a masterclass as part of a series at McDonogh School in Owings Mills, Maryland titled An Artist Works: Tools of the Trade where she will discuss vocal technique, the key elements to having a successful audition, and how to make a website and a résumé. Today was my daughter's first lesson with Jamie. She was totally delighted!!! Jamie made her feel very comfortable and wishing more time together. Jamie is very professional and knowlegeable. I'm very glad I choose her and I recommend her to anybody. Jamie is an amazing instructor. She is very professional and takes the time to give me encouragement. I recommend her highly. Ms. Jamie is everything that embodies a wonderful and professional piano teacher. My child adores her and is learning so quickly. Aways enthusiastic for the next class. Very helpful in fixing technique problems and finding repertoire . Friendly and easy to work with. Good piano skills. Smart and knows a lot about opera. Jamie was a very patient mentor, and incredibly easy to work with! She had a strong, positive energy that really helped make a strong connection. Her techniques are sound, and the way she explains them is easy to follow and, more often than not, quite fun! Jamie was my voice teacher for two summers and I really grew through all the lessons I had with her. I also really enjoyed the time I spent working with her and felt very comfortable being around her. Jamie worked very hard to make me a better singer and performer. She stretched by range and improved many other aspects of my voice and performing. She also was able to greatly expand my repertoire. When beginning my lessons with Jamie I did not have much experience with singing songs that were not musical theatre. During my lessons with Jamie I continued to sing musical theatre pieces, as well as songs from many other genres. Through my lessons I was able to become a much better all around performer. I strongly recommend Jamie to anyone looking for a voice teacher! Jamie taught my middle school aged daughter voice lessons for two consecutive summers. She is knowledgeable, enthusiastic, and makes people feel very comfortable. They worked on basic technique, and studied music from various genres. The lessons were always tailored to meet my daughter's unique interests and needs. 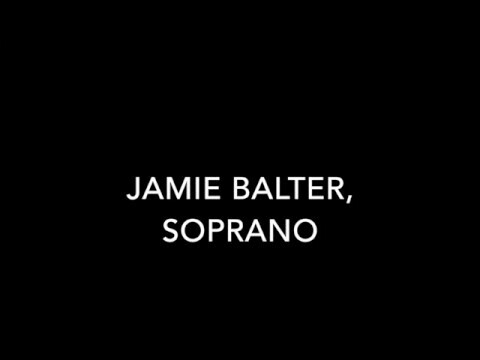 I would recommend Jamie as a voice teacher with no hesitation!! In my lesson with Jamie, we worked on using correct vowel placement to open up my sound. When the lesson was over, the sound changed dramatically. My voice was more open and clear, with a freer production. Jamie made me feel confident in my sound and my technique. I would recommend Jamie to anyone enthusiastic about studying voice!